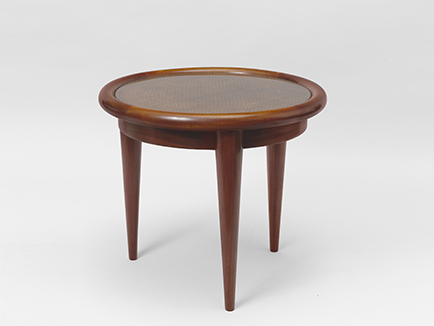 Jean Royère took up interior design at the age of twenty-nine, developing his skills in the cabinetmaking workshops on Faubourg Saint Antoine in Paris. 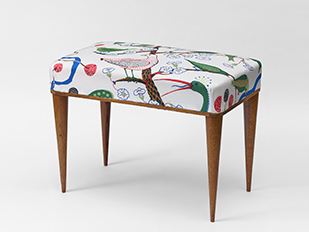 Originality of style—bright colors, organic shapes, precious materials, and a range bearing a personal poetic stamp—brought him immediate international success. H. 30.31 x L. 42.13 x D. 22.44 in. H. 22.44 x L. 29.13 x D. 15.75 in. H. 15.35 x L. 11.42 x D. 7.09 in. H. 22.44 x ø 14.96 in. H. 39.76 x L. 32.28 x D. 34.25 in. H. 30.31 x L. 22.05 x D. 20.87 in. H. 25.59 x L. 28.35 x D. 29.13 in. H. 39.37 x L. 24.8 x D. 20.87 in. H. 30.51 x ø 12.6 in. H. 33.27 x L. 26.57 x D. 23.23 in. H. 31.5 x L. 17.91 x D. 17.91 in. H. 28.74 x L. 17.91 x D. 19.69 in. H. 13.58 x L. 51.18 x D. 21.65 in. H. 13.39 x L. 36.61 x D. 21.65 in. H. 14.57 x L. 55.12 x D. 27.56 in. H. 16.54 x L. 47.24 x D. 23.62 in. H. 29.13 x ø 49.21 in. / With leaf H. 29.13 x L. 72.83 x D. 49.21 in. H. 28.35 x L. 88.19 x D. 45.28 in. / H. 28.35 x L. 127.56 x D. 45.28 in. H. 31.5 x L. 49.2 x D. 13.8 in. H. 33.66 x L. 62.99 x D. 17.72 in. H. 62.99 x L. 55.12 x D. 16.54 in. H. 28.94 x L. 31.5 x D. 14.17 in. H. 31.5 x L. 80.31 x D. 39.37 in. H. 29.53 x L. 62.99 x D. 23.62 in. H. 35.43 x L. 86.61 x D. 17.72 in. H. 38.19 x L. 51.18 x D. 15.94 in. H. 21.65 x ø 24.41 in. H. 17.52 x L. 34.65 x D. 17.32 in. H. 28.35 x L. 55.12 x D. 27.56 in. / H. 26.18 x L. 21.65 x D. 24.41 in. H. 38.19 x L. 75.59 x D. 59.06 in. H. 29.53 x L. 48.82 x D. 20.47 in. H. 29.53 x L. 43.31 x D. 21.65 in. H. 28.74 x L. 71.06 x D. 15.35 in. H. 16.54 x L. 21.85 x D. 12.99 in. H. 50.39 x L. 33.46 x D. 3.15 in. H. 31.3 x L. 27.17 x D. 19.69 in. H. 30.12 x L. 30.31 x D. 10.63 in. Jean Royère is born in Paris in 1902. Hisfather Léonce Royère, of Breton extraction, is a high-ranking civil servant at the Paris Préfecture, and his mother, Marguerite Niers, was born in Vienna into a family from Lorraine that emigrated after the war of 1870. Jean’s upbringing is strict and sheltered: after a classical education at the Condorcet, Fénelon and Sainte-Marie-de-Monceau secondary schools, he begins studying law; further studies at Cambridge are followed by a return to France for his military service in 1925. From 1926 to 1931 he works for his uncle, Jacques Raverat, director of a successful import-export firm in Le Havre. 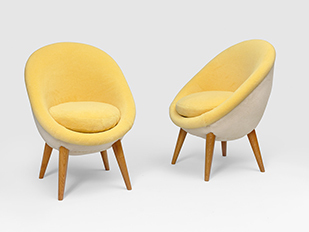 Encouraged by Louis Metman, chief curator at the Musée des Arts Décoratifs in Paris, and with help from Jacques Raverat, Royère decides to follow his true vocation as an interior designer. To learn his craft he takes a job in a furniture factory on Boulevard Diderot, where he works until 1933. >His first customer is his uncle, for whom he designs a bedroom and boudoir ensemble in exotic woods—there are references to Jacques-Emile Ruhlmann—and slimline garden furniture. He also designs offices for the Le Havre Port Authority. Royère’s remarkable skills are in evidence from the outset, in his surgery and apartment for Dr Philippe Decourt. Stripped of all ornamentation, the furniture combining tubing and strips of chromed metal points up his interest in the modern movement, but with an already perceptible touch of personal tweaking. Some of these pieces will be adapted for mass production for the Aplemont workers’ housing estate at Frileuse, near Le Havre. Renovation of the Hotel Carlton’s brasserie on the Champs Elysées brings Royère into the spotlight. In charge of the terrace, the first-floor lounges and the basement, he comes up with a sober, pastel-toned decor and furnishings of metal tubing, Bakelite and rattan. Success is immediate and earns him an article in Art et Industrie magazine, directed by Waldemar George. 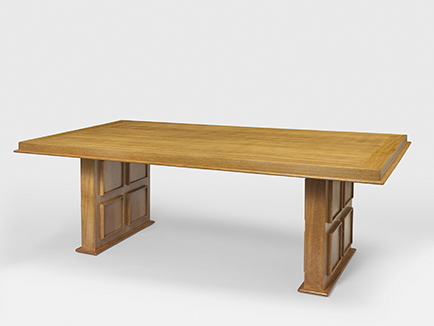 Pierre Gouffé, a noted Faubourg Saint-Antoine furniture manufacturer specializing in period pieces, is sufficiently impressed by his work to put him in charge of his firm’s contemporary section. 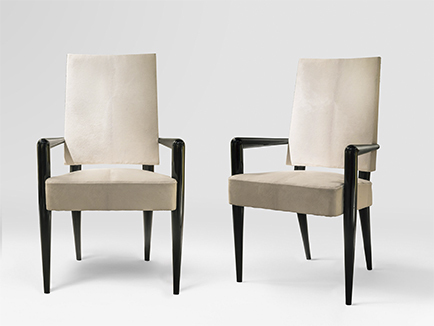 With Gouffé’s backing Royère makes his first appearance at the Salon d’Automne, taking out a bronze medal for his chairs for Dr Decourt. He moves into an artist’s studio on Rue de Passy in Paris, which he furnishes using tubing and metal strip creations. 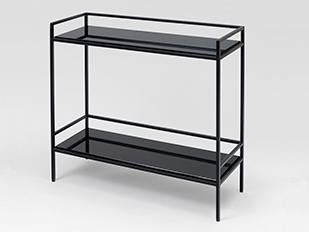 Faithful to the modernist principle, he incorporates a multifunction item of his own design. He brings the same approach to fitting out the Gautier apartment, dividing the living room in two with a set of low bookshelves. At the Salon d’Automne he shows a combined living/ dining room with waxed zebrano wainscoting, a sideboard, a brushed oak table with a white opaline top, and floral curtains that bring a touch of light into a brown-toned setting. This creation appears on the cover of the magazine Le Décor d’Aujourd’hui. He also presents a study and a veranda at the 25th Salon des Artistes Décorateurs. At the Salon des Arts Ménagers he shows a whitelacquered wood bedroom setting and an oak dining room ensemble, as well as taking part in a “weekend house” competition organized by the 3rd Exposition de l’Habitation, the homes show overseen by curator André Bloc: to the winning project by architects Grandjean & Guénec, he contributes furniture using angled metal, sheet metal and fabric, which will later go into mass production. He becomes a member of the Salon d’Automne, where he presents a girl’s bedroom setting in varnished ash. As parts of a single structure, the bed and table demonstrate his ability to come up with simple, economical forms.He also wins the Foch Foundation’s competition for equipping the 120 bedrooms at the nursing school at the surgical medicine center in Suresnes. At the same period he designs mass-production furniture for the Aplemont workers’ housing estate, designed by architect Jean Walter for the Le Havre Economical Housing Company. 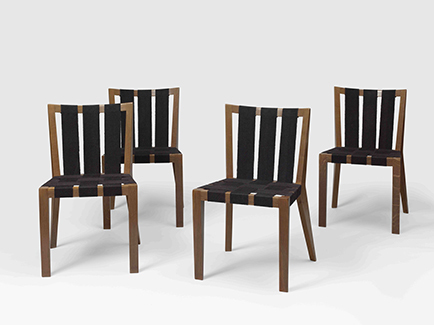 Selected for the Milan Triennial, one of Europe’s biggest events in the design field, Royère discovers such Italian and Scandinavian counterparts as Gio Ponti and Alvar Aalto, who will influence his notion of his craft. Held in Paris, the International Exhibition of Art and Technology in Modern Life sets the seal on Royère’s reputation as one of the most original and creative designers of the moment. His seventeen commissions there include ensembles for the Decorative Artists’ pavilion, the Aluminum and Ceramics pavilions, the inn at the Centre Rural, and the pavilions for Private Architecture, the New-born Child, and Furniture Ensembles. 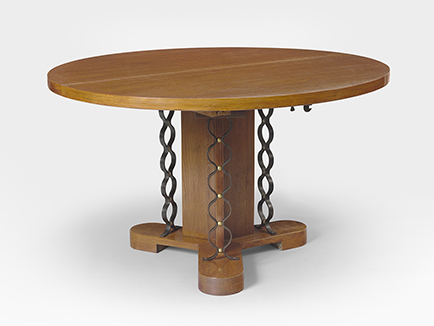 In the Decorative Artists’ pavilion his summer and winter nooks—the Coin de repos pour l’été and the Coin de repos pour l’hiver—herald the stylistic shift that would become apparent at the Salon des Artistes Décorateurs in 1939. At the Salon d’Automne he presents a luxury version of the Foch Foundation’s nurses’ bedrooms, and at the Salon des Arts Ménagers a cherrywood dining setting whose buffet and chairs are ornamented with a lattice pattern. At the Coin de Monsieur et Madame exhibition organized by Art et Industrie magazine, he shows the bookshelf model designed for the Foch Foundation the year before. He also becomes a member of the Salon des Artistes Décorateurs. For his friend Henri Lazard’s apartment in Passy, Royère’s creations include an armchair of oversized metal tubing, reminiscent of Dr Decourt’s 1932 sofa. In a house on the shore of Lac d’Enghien, the same tubing—but in lacquered wood—forms the structure of the furnishings and highlights the windows and doors. In an apartment he designs for a Savoie family moving to Rue du Général-Foy in Paris, this tubing outlines an alcove and the contours of a sofa bed. 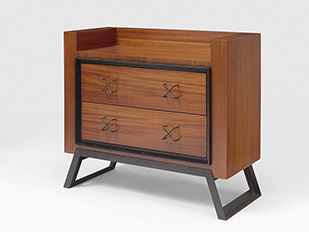 At the Salon des Artistes Décorateurs, his chest of drawers is a model of modernist sobriety: with no handles or ornamentation, its front achieves its decorative effect from white lacquered drawers framed with blond oak. As organizer of the Decorative Art section at the Salon of French Art and Interior Design in Cairo, Royère obtains his first commission in the Middle East: the apartment of the president of the Cairo stock exchange.< He also designs the sets for Acts 3 and 4 of Septembre, a play written by Constance Coline and presented at the Théâtre du Vieux- Colombier in Paris. Specially combined with the Salon de la Lumière lighting show, the 29th Salon des Artistes Décorateurs sees Royère show a boudoir as an artistic statement, in a return to ornamentation for items that will become classics within his repertoire: the Champignon standing lamp, the Trèfle chair and the Éléphanteau armchair. 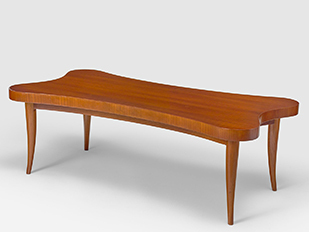 Some of his memorable motifs make their first appearance here, notably the biomorphic shapes. The critics, however, respond neither to his determination to establish a decorative vocabulary nor to the modernity of some of the pieces, and dismiss his work as “fairground Baroque.” He also shows the Éléphanteau armchair with an Anneaux standing lamp at the Palais Galliera, as part of the exhibition From Idea to Form, organized by the Porza Association. Once again he is an entrant in André Bloc’s Exposition de l’Habitation, for which the theme is the hotel room. The judging panel awards him third prize for furniture whose sheet metal is perforated with cross-shapes and profiled with red and white-lacquered metal. These pieces will ultimately be mass-produced. Initially mobilized as an artillery sergeant at the Fort de Charenton, then at Fontainebleau, after France’s defeat Royère returns to working for Pierre Gouffé. Using his work as a decorator as cover, he is an active member of the Resistance until the end of the War. He carries out a few commissions, including the Henry à la Pensée haute couture store on Rue du Faubourg Saint-Honoré, and continues to take part in furniture exhibitions. At the Salon d’Automne he shows a rustic dining setting together with an oak closet whose openwork doors form frames for four stained glass panels by Max Ingrand. 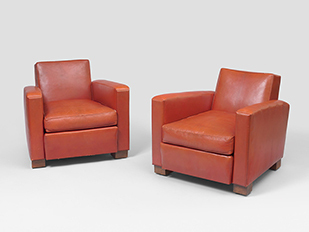 These rurally inspired furnishings reflect not just his own taste, but also a certain return to tradition that marked the period. 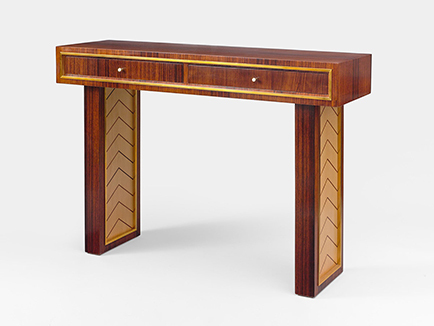 At the exhibition jointly organized by the Salon des Tuileries and the Société Nationale des Indépendants, Royère presents a sanded oak sideboard, once again of rustic inspiration, whose diagonal wooden panels form chevrons highlighted with studded red leather. At the 30th Salon des Artistes Décorateurs his mountain chalet living room is given a warm public reception. The ensemble features a staircase of fir slats perforated with playing card motifs—their first appearance in his ornamental repertoire. A goatskin-covered armchair in front of the fireplace signals the Banane sofa to come. Still gutsy and rebellious despite the German occupation, Royère used a Tricolor decoration for the fireplace. 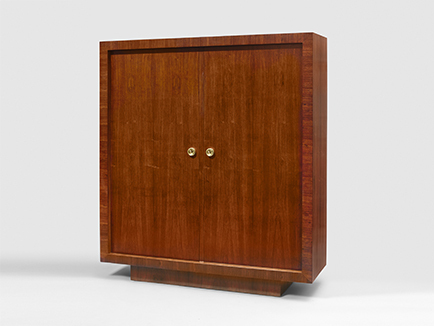 At the Exposition Nationale des Beaux-Arts he shows a meticulously executed closet veneered with waxed zebrano wood, the work of cabinetmakers Sanyas and Popot. He leaves Gouffé to open his own agency on Rue d’Argenson in Paris. At the Salon d’Automne Royère presents his first straw marquetry piece, a sideboard embellished with red and green straw stars. 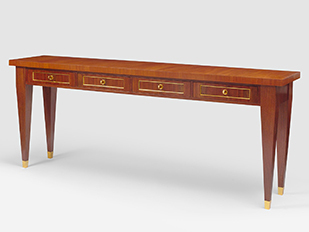 Adapting to the general tendency of a return to the styles of the past, he comes to the Salon d’Automne with a twodoor, two-drawer neoclassical rosewood sideboard. 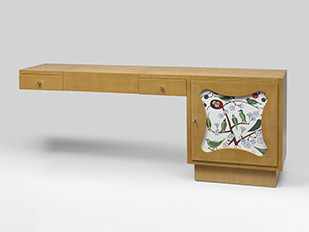 For the Salon des Artistes Décorateurs his contribution is a rustic-inspired oak bedroom setting in the spirit of the sideboard shown at the Salon des Tuileries in 1941. Deciding to break into the foreign market, he opens the Jean Royère et Aladin gallery at 8 Rue Kasr-el-Nil in Cairo, nextdoor to the Livres en France bookshop run by his poet friend Nelly Vaucher-Zanari. Gabriel Chamma becomes his permanent representative. The magazine Plaisir de France commissions him to decorate their offices. At the 32nd Salon des Artistes Décorateurs he shows a rustic, Provençal-inspired dining room for an inn, furnished with Ondulation tables and chairs. His contribution to the Art de la Table exhibition organized by Art et Industrie magazine is a table whose limestone top rests on legs whose three undulating tubes enclose a suspended metal ball. He becomes a member of the Société Nationale des Beaux-Arts. Royère redecorates his mother’s Paris apartment, at 234 Rue du Faubourg Saint-Honoré, prior to moving in. 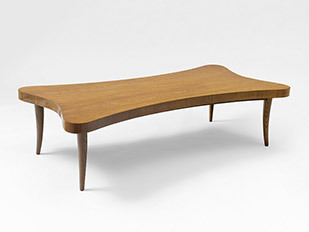 This marks the appearance of his first biomorphic pieces: a Boule sofa and a Flaque coffee table. 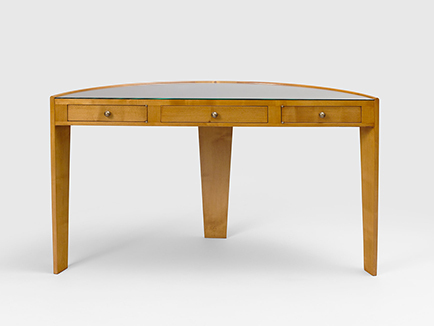 The same year he creates the Bureau pour une femme d’affaires (Desk for a Businesswoman) in gray-lacquered sheet metal dotted with white dots. 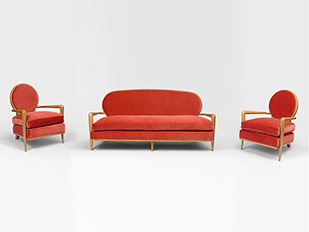 Accompanied by a Tour Eiffel table and standing lamp, the Boule sofa is shown in a dark red version at the La Résidence Française exhibition organized by Art et Industrie magazine. At the Salon des Artistes Décorateurs he offers a canopy bed featuring latticepatterned red-lacquered metal tubing. Aiming at the summer market, he opens a new Jean Royère et Aladin gallery on Place aux Herbes in Saint-Tropez. The success of his Egyptian venture leads him to create an agency on Avenue des Français in Beirut, in association with Lebanese architect Nadim Majdalani. Understanding each other perfectly, they win commissions for the country’s major decoration projects. The decoration of a big holiday house in Sainte-Maxime is the chance to develop his new ornamental vocabulary, and he brings real whimsicality to his mixing of materials and colors. 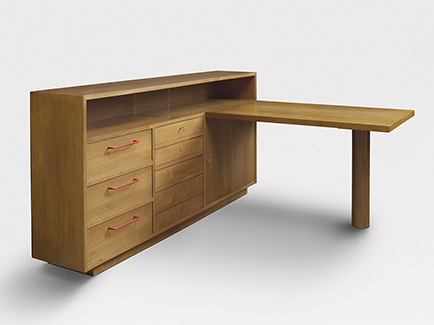 He will later design more sober bedroom furniture in exotic wood for the same client’s Parisian apartment. He contributes to the Dîners d’Eté (Summer Dinners) exhibition, organized by Art et Industrie magazine, and to the Salon des Artistes Décorateurs with a Bachelor Attic. Headed notepaper from this period makes mention of a gallery on Rue Saint-Jean in Le Touquet. His decoration of the reception rooms at the French Consulate in Alexandria—his first public commission—establishes his reputation in Egypt. 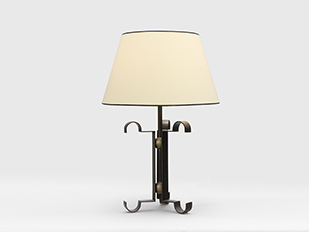 Revolving around sycamore and bronze, his approach combines the luxurious and the restrained; his fanciful side is only allowed to show through in the wool carpet for the dining room and the huge Hérisson ceiling lamp in the main lounge. The luxurious furniture for the Boutros-Ghali family’s dining room in Cairo is made of Macassar ebony sheathed with parchment. Between 1948-1953 he carries out major projects in Egypt—among them the Shepheard’s and Semiramis hotels—as well as doing interior design for local notables and French company directors. Royère leaves Rue d’Argenson for a more spacious, two-level gallery at 182 Rue du Faubourg Saint-Honoré, where he organizes major exhibitions. 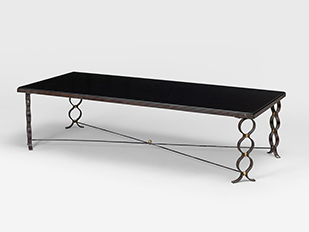 For the 9th Salon de l’Imagerie Française at the Palais Galliera, where he is in charge of the Garden Furniture and Decoration section, he bases an entire set of garden furniture on a sine curve of garnet-colored lacquered metal tubing. At the Salon des Artistes Décorateurs he presents an impressive study in zebrano wood, with a lounge-corner offering a version of his Banane sofa and a Flaque coffee table. 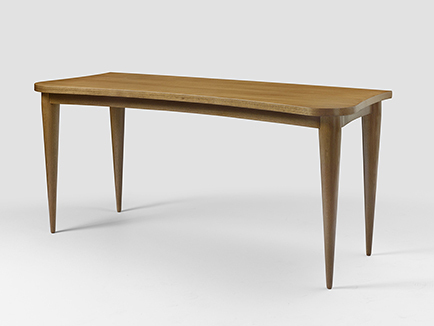 He meets Gaston Dutilleul, who commissions him for his Parisian apartment and will remain a loyal client until 1972. He takes part in the Formes Françaises exhibition at the Maison de France in the Rockefeller Center in New York, organized by Art et Industrie magazine. Royère’s sole project in North America is the Kuwait Embassy in Washington, to which he gives a period look. In Egypt the French government commissions the decoration of a lounge ornamented with a Jean Cocteau fresco for the Cultural Center in Cairo. Published in no. 53 of the magazine Le Décor d’Aujourd’hui, his “Travel Notes of a French Interior Designer in Scandinavia” recount the powerful impression made on him by Scandinavian decorative art. Royère produces classically elegant sycamore furniture for the lobby and one of the dining rooms at the Drouant restaurant in Paris. At Thonon-les-Bains in Haute Savoie he works on a weekend house with architect Maurice Novarina. He also designs a table and some wall lamps for Novarina. The Ministry of Foreign Affairs engages him for the lounges in the new French Legation in Helsinki, built by French architect Félix Bruneau and Finnish architect Erkki Huttunen. Here he allows himself greater freedom than at the consulate in Alexandria, installing garnet and yellow Boule armchairs on a vast, white, freeform wool carpet. Royère visits the Milan Triennial and the festival held in London to mark the centenary of the Universal Exhibition. His two articles about the events appear in nos. 65 and 66 of Le Décor d’Aujourd’hui. At the Salon des Arts Ménagers he shows rattan bedroom furniture and a black-lacquered dining room ensemble; the latter notably includes a three-segment sideboard whose central panel, outlined by a sine curve, is covered with raffia. At the Spirit of Paris exhibition organized by Art et Industrie magazine at the Musée des Arts Décoratifs in Paris, Royère presents a young people’s bedroom whose royal blue felt corner banquette is dotted—like the curtains—with tartan fabric. 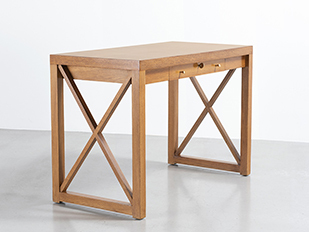 The design of the Mille Pieds standing lamp recurs in the legs of both the table and the console, and two oak desks are set into an S-shaped lacquered metal structure. A biomorphic chair and armchair of royal blue-lacquered metal are the work of his associate Jean-Paul Gauberti. 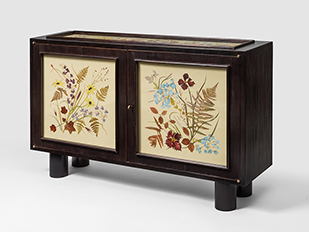 At the 36th Salon des Artistes Décorateurs, his varnished ash bedroom furniture is embellished with panels of dried flowers. The political situation in Egypt forces him to close his Cairo gallery, but he maintains a consultancy there, directed by Ernest Chouchani, until 1957. In Saudi Arabia he decorates the palace built by architect Nadim Majdalani for Prince Faisal. He buys a small fisherman’s house in St-Tropez and christens it Le Coin Timbré (Stamp Corner) after the postage stamp panels he uses to decorate the doors. In Paris he contributes to the exhibition The Happy Home: Paule Marrot and Her Friends, at the Musée des Arts Décoratifs. 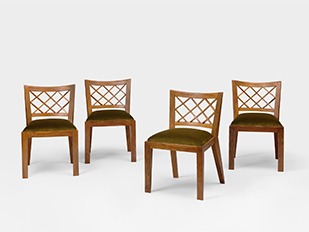 At the Salon des Arts Ménagers, he presents lattice-patterned rattan core dining room furniture, and at the 37th Salon des Artistes Décorateurs, a mahogany dining room ensemble created for the Drouant restaurant. Supervising the renovation of the Le Capitole hotel in Beirut, one of the biggest luxury establishments in the Middle East, he has the furnishings and decorative items made by Lebanese tradesman. While taking a sober approach to the rooms, he lets his imagination run free in the reception areas, notably with marble floors all made to different designs. At the 38th Salon des Artistes Décorateurs, where the theme is “Youth and the Living Environment”, he presents Mon Coeur Balance, a project for a bar in a youth hostel in the Alps. Its system of rope V’s prefigures his Yo-yo motif. For the Salon des Arts Ménagers he designs the Egg armchair, covered with orange rep and gray velvet. 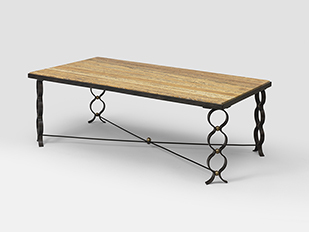 It is accompanied by a Flaque black straw marquetry coffee table with traces of red and yellow and multicolored stars. 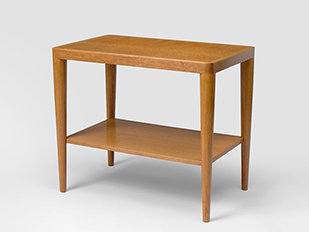 This table will become a classic part of the Royère repertoire. Royère brings his humorously fanciful touch to the decorating of an artist’s studio in Montmartre. And for a California-style house built by Wolfgang Ewerth for Serge Varsano in Casablanca, Morocco, he combines his own furniture, notably the Sculpture armchairs, with contemporary pieces by Jacques Adnet and Serge Mouille. During an exhibition he organizes at the Tehran University of the Arts, he gives a lecture on interior design. This leads to a meeting with architect Mohsen Foroughi which will be decisive for his career in Iran. At the 39th Salon des Artistes Décorateurs, Royère presents the office designed for fabric dealer Raoul Voos. It includesSculpture armchairs covered with purple-patterned chintz and Leklint paper lamps by Danish architect Kaare Klint. 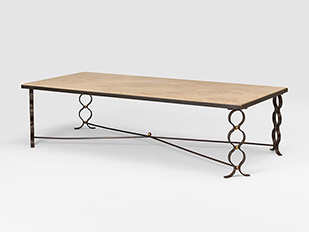 The Salon des Arts Ménagers features a metal coffee table designed for an admirer of Calder, with a boomerang-shaped top seton Yo-yo legs. He decorates the bedroom and dining room of singer Henri Salvador’s apartment in Paris. This is also the period of the first known version of the Liane wall lamp, already seen in the maquette for the conversion of a mill in 1952. 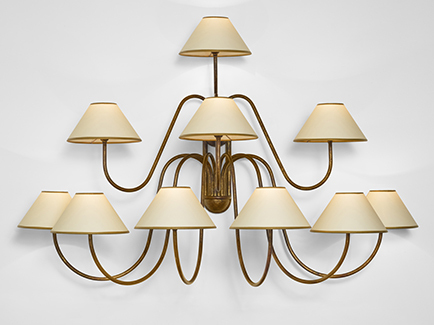 In the Middle East he designs neoclassical furniture for the Arab Bank in Baghdad, working in collaboration with wrought-iron craftsman Raymond Subes. He also designs the interior of the restaurant at the Ambassador Hotel in Jerusalem; and creates oak office furniture in a biomorphic vein for King Hussein of Jordan’s palace on the shores of the Dead Sea. In Beirut architect Nadim Majdalani opens Royère’s L’Atelier gallery on Avenue Sleiman-Boustani, which takes over from the agency on the Avenue des Français. Despite prestigious commissions, Royère senses instability in the Middle East; deciding to turn to Latin America, he opens Le Magasin de Paris in Lima, in association with leading Peruvian antiquarian André Castoriano. At the 40th Salon des Artistes Décorateurs he presents his Charme de Paris bedroom, with skirted Yo-yo chairs and a canopy bed that combines the metal frame with exuberant tulle hangings. 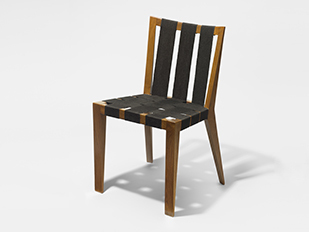 Meanwhile the decoration of a contemporary house by architect Alfred Bernard at Pontault-Combault, near Paris, signals a decisive change in Royère’s work, now focused exclusively on furniture. In his Rue du Faubourg Saint-Honoré gallery he organizes a largescale exhibition of lacquerwork by Bernard Dunand, Jean May- Laffite, Maurice Alvo, René Fumeron, and André Dambrun. Commissioned to decorate the office of the president of the new Chamber of Commerce in Le Havre, Royère comes up with neoclassical pieces in a context of teak woodwork orchestrated with columns. In a very different spirit he equips the bedrooms, dining room, bar, and lounge of the Steel Research Institute (IRSID) near Metz. 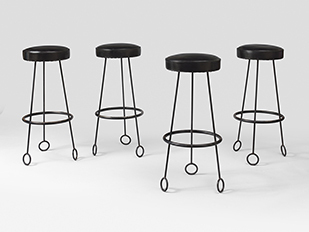 The bar stools have seats in the form of soccer balls and the lounge furnishings—armchairs with incurving backs and freeform coffee tables—are based on the same black metallic structure rounded off with a Yo-yo motif. Jean Royère restores his family home, Le Loch-Bihan, at Auray in the Morbihan département. Extending his activities to Brazil, he opens the Esquisses gallery in São Paulo. The director is Ernest Chouchani, his former representative in Cairo. He collaborates with architect Pierre Vago on the interior of the Le Fouquet’s brasserie on the Champs Elysées. To mark the occasion of his marriage to Farah Diba, the Shah of Iran asks Royère to design two lounges, a study and a cinema for the Sa’ad Abad palace. He also commissions the designing of apartments for his sisters, the princesses Shams and Ashraf, and his daughter, Princess Shahnaz, for whom Royère creates witty garden furniture. In addition, he makes furniture for Princess Shahnaz’s private office, whose metal-rod legs are held together by balls of copper. The sheer scope of these projects leads Royère to open an agency in Tehran. He does the interior design for the Amman Club hotel, one of Jordan’s biggest luxury establishments. Cheminées et Coins de Feu, a book on contemporary fireplaces, is published by Editions Charles Moreau, with a preface by Jean Royère. The 41st Salon des Artistes Décorateurs will be Royère’s last. 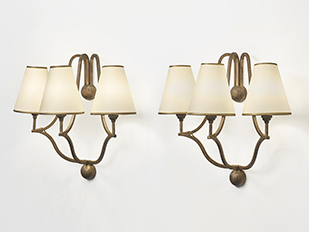 He shows the biomorphic armchairs created for the Shah of Iran’s cinema and, for the first time, the Liane wall lamp. In addition to decorating the Park Hotel in Tehran, a project commissioned by the Diba family, he works on Baharestan Palace, the new Senate building designed by Mohsen Foroughi and Heydar Ghiai. The Senate chamber is provided with gilded aluminum seats covered with garnet leather. For the Shah’s Sa’ad Abad residence he creates a markedly architectural desk whose two slabs of glass are held in place by two strips of metal. The Senate project makes Royère’s name in the Middle East. Royère has a “Brigitte” model prefabricated housebuilt for himself at La Dormerie in the Forest of Marly. Gaston Dutilleul asks him to help fit out the townhouse in Boulogne which includes his living quarters and the school for disadvantaged children he has founded. For the dining room Royère designs a buffet whose three doors have concave squares cut through them; the structure, with its patinated steel rods attached to the buffet with balls of copper, is reminiscent of the furnishings made for Princess Shahnaz. The Compagnie Générale Transatlantique calls on Royère and Jacques Lévy-Ravier for the decoration of the captain’s quarters on the ocean liner France. 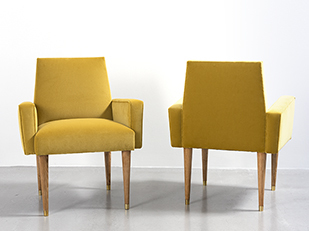 Royère is meticulous in his choice of colors and the way they contrast with the black-lacquered furnishings. He also fits out cabins for the liner Mélusine. Other projects include the Bristol Hotel in Beirut and an apartment for Mohsen Foroughi, in which he combines the Liane wall lamp with seating by Eero Saarinen and Harry Bertoia. Royère organizes an exhibition of drawings in Neuchâtel, Geneva, and La Chaux-de-Fonds, and engages a representative for Switzerland. An exhibition at the Memorial Union in New York features his latest creations, notably the models and photographs of Baharestan Palace and of the cinema designed for the Shah of Iran. In Saudi Arabia he produces a luxurious, highly ornamental, orientallyinflected decor for the palace of the king and queen. He designs his cousin Roger Brian’s offices at the Maison de la Radio in Paris, newly built by architect Henry Bernard (1912-1994). 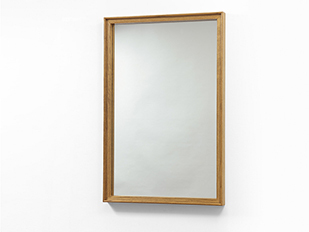 Royère makes his last visit to the Milan Triennial. His article “The 13th Milan Triennial” on the event appears in the January-February issue of Mobilier et Décoration. For his final participation in an exhibition—Décors Insolites chez Tristan de Salazar, at the Hôtel de Sens in Paris—he presents a project for a “living room on the 50th floor of a building in Manhattan,” which brings together his most accomplished creations: the Flaque coffee table, Banane sofa and Liane wall lamp. He has the villa Almudayna built for him on Majorca. Asked to handle the decoration of offices, the bedrooms and the reading space at the Fondation Avicenne, the student residence in Paris designed by André Bloc, Mohsen Foroughi and Claude Parent, Royère creates restrained ensembles including pieces by such design greats as Harry Bertoia and Eero Saarinen. Royère publishes Harems et Pieds Dorés (Harems and Gilded Feet), a portrait of the Middle East and the kings and princes he has worked for. He also writes an autobiography, which remains unpublished. Jean Royère bows out of the interior design business. He now divides his time between France and the United States, which he makes his home in 1980. 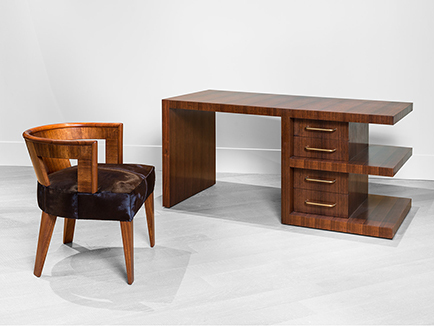 He calls in Axel de Heeckeren to organize a sale of his furniture, which takes place at Hôtel Drouot in Paris on 19 June 1980. 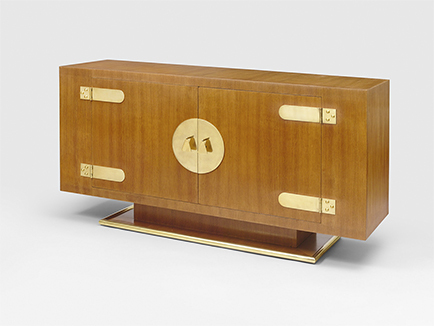 He also consults the curators at the Musée des Arts Décoratifs in Paris, to which he bequeaths his archives and some of the furniture from his apartment, including a Banane sofa, a free-form black carpet, a straw marquetry sideboard, a Persan wall lamp, and curtains by Paule Marrot. On 14 May Jean Royère dies in Pennsylvania.